During the Autumn of 1205 at the age of 23 Giovanni “Francesco” Bernardino knelt before the Orthodox style cross in the small tumbled-down church of San Damiano. As his eyes gazed up what would he see? As his soul opened to God what words would he hear? Francis was born into wealth and had a privileged and worldly life in pursuit of pleasure, personal advancement and vainglory. After spending his youth revelling in extravagance, seeking honour as a knight and experiencing physical and mental suffering through imprisonment and illness, he sought something more as he walked around the countryside of Assisi. He sought the meaning and purpose of his life. 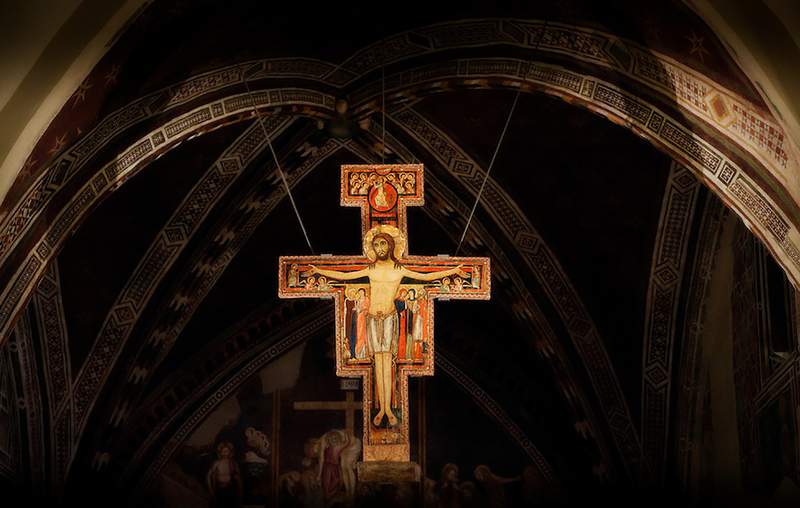 The original cross is now in the Basilica of Saint Clare (Basilica di Santa Chiara) in Assisi. Today a replica has been placed in the church of San Damiano where Francis heard the voice of Our Lord. Francis’ faith was forming, yet not fully mature in uderstanding. He answered God’s call initially by rebuilding the run-down structure of San Damiano church and others near by too. He obeyed the call as he best understood it. Then over time he came to realise that what his Lord Jesus Christ desired most was that Francis should build up the faith of God’s people. He should show the life of Christ, the embrace of the Holy Spirit and the love of God to everyone and every part of Creation. The Church during the time of St Francis was then, as today, so very in need of new life. Francis of Assisi became that example of new life, a life of following Christ, a life of uncomplicated simplicity, of poverty, a life and example he shared with others. 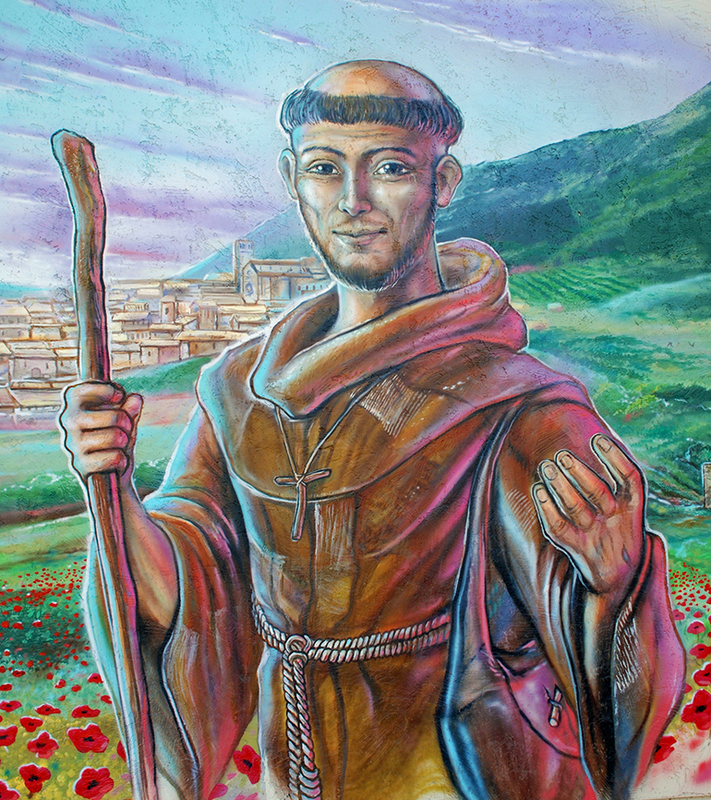 It was Francis’ joy, embrace of poverty and love for Our Lord that enthused others to follow him and that led to the foundation of the two religious orders – the Friars Minor and the Poor Clares. Many more were attracted to the life-style of St Francis and they too wanted to adopt his way of living; but they had home, work and family responsibilities they couldn’t leave, so Francis established a third order – the Brothers and sisters of Penance. 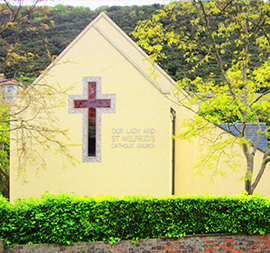 Some 800 years later these three orders are a treasure of the Catholic faith, a vocation for both the “religious” and the laity – They are the Franciscan family. The Franciscan Family called 800 years ago, at the foot of the San Daminao Cross, to “rebuild My house”. Today the “Brothers and Sisters of Penance” are known as the Secular Franciscan Order, or to use our Latin name the Ordo Franciscanus Saecularis. 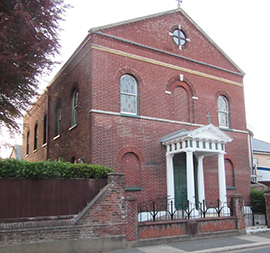 Above is a reconstruction of St Mary of the Angels as it would have looked after Francis rebuilt it. 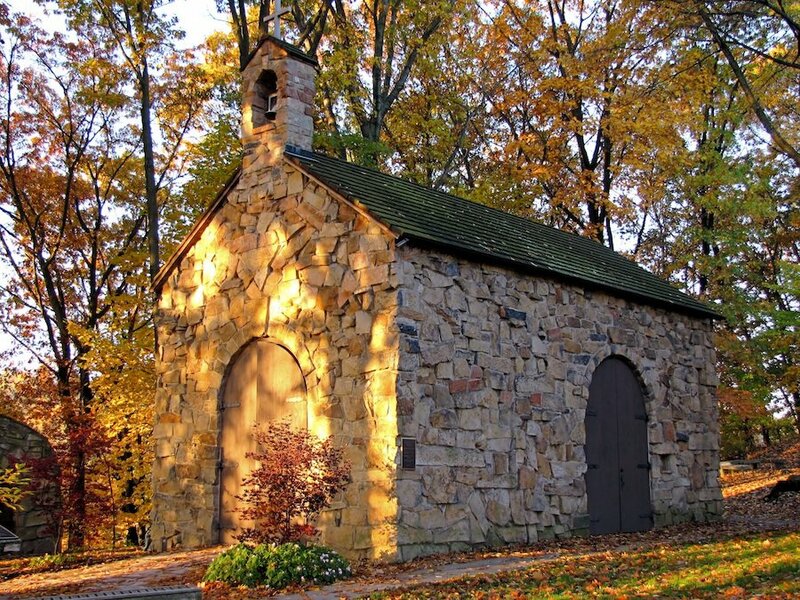 It was a Benedictine chapel known as the Portiuncula or Porciúncula meaning “little portion” or small plot of land. It was at the Portiuncula on Palm Sunday 1211 that Saint Francis received Clare of Assisi and dedicated her to the Lord. From here the faith and spirit of Francis grew into today’s Franciscan Family. Main Photo : From Dronestagr.am Drone Photography Competition 2016 – Winner of the Travel Section taken by Francesco Cattuto and titled the “Basilica of Saint Francis of Assisi” taken 26/12/2016 during a walk after lunch.